Hopefully, by now you’ve checked out our Cookbook Gift Guide and our Cocktail Gift Guide. The question that remains is what to do with these awesome gifts once you’ve purchased them. Sure, you could wrap them. Why not up the ante a bit and make a fantastic gift basket? This type of gift basket can be a bit more challenging to complete but the payoff is huge. What taco lover or pizza lover wouldn’t love a basket themed around their favorite food? For a food themed basket, find items that represent that food or can be used to make it. 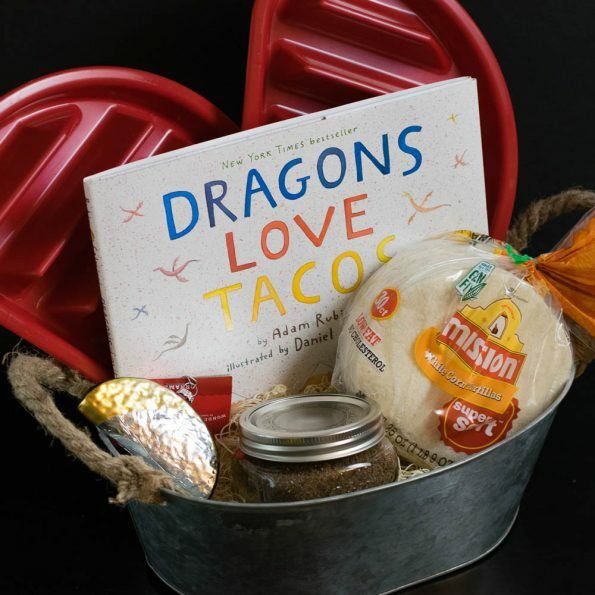 For example, in our Taco Gift Basket, we selected a fun book featuring tacos, homemade taco seasoning, tortillas, a taco ornament, and taco trays. The gifts included are a mix of practical and fun. This is one of the more fun gift basket ideas. Select a color and see what you can come up with! 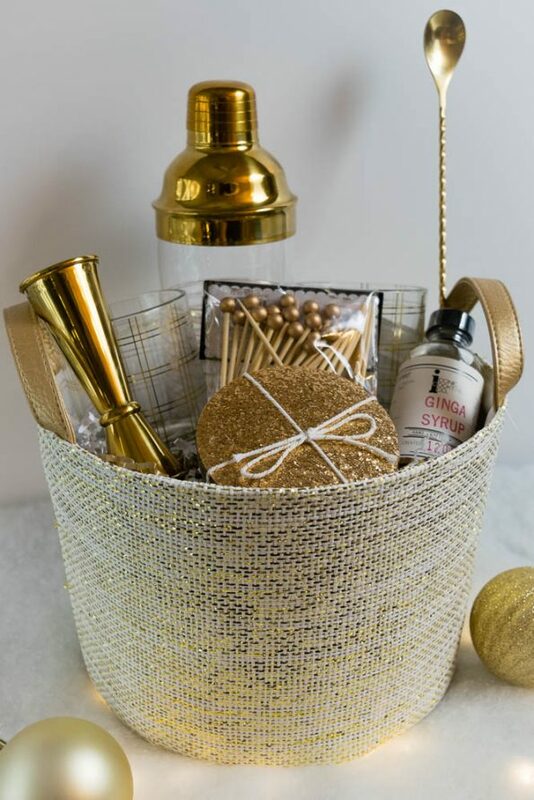 We went with yellow gold and created a fun and unique cocktail themed basket. Stores like Target, Home Goods, and even Amazon can be your biggest ally when looking for color specific items. If your color isn’t a holiday color, start buying items during the time of year that it is seasonal. What better way to show someone you care than with a locally produced gift? Find gifts from local provisioners to share with friends and family. 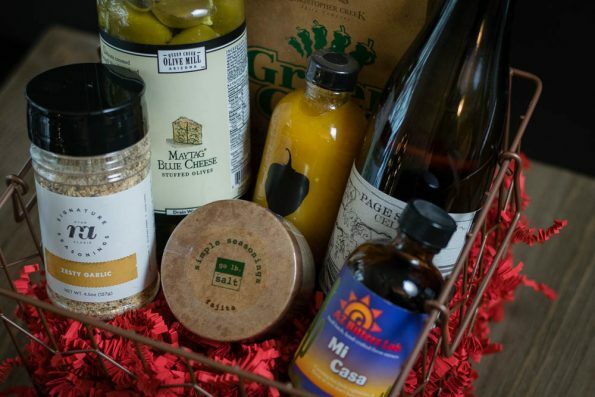 These gift baskets are especially fantastic for loved ones who live out of state. It is like giving them a little piece of the things you get to enjoy on a regular basis. For some of our favorite local products, check out our Things We Love Thursday posts. Our pal Angel over at Yay Baby blog has also compiled a fairly extensive list of local products as well! We hope this helps you build the perfect gift for your loved ones. The great thing about gift baskets is that they let your creativity shine. You can build them as large or as small as you’d like and they can accommodate all sorts of budgets. What are your favorite gift basket gifts? Leave a comment below or tag us in your gift basket photos! We’d love to see them! Happy Holidays!